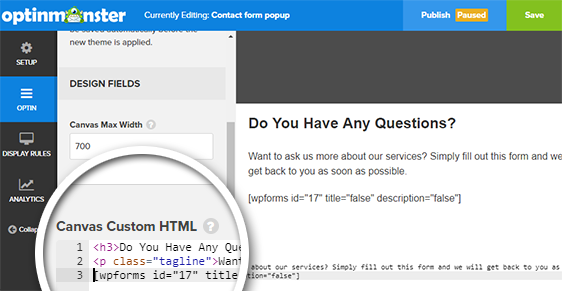 Are you looking to add a contact form in a popup for your WordPress site? By using a contact form popup, your website visitors don’t need to navigate away to another page when reaching out to you. 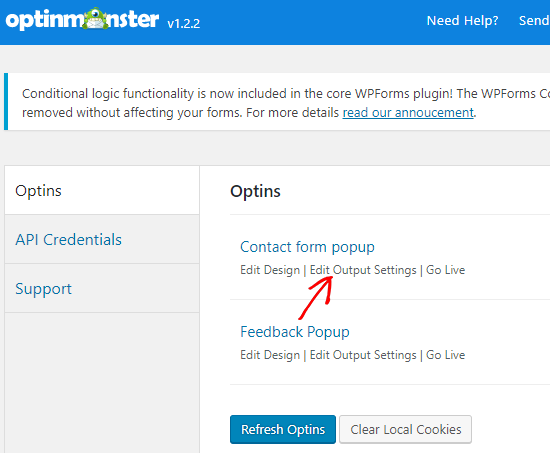 In this article, we will show you how to create a contact form popup in WordPress. Contact forms can be used for more than just general inquiries. You can give your readers a quick way to reach you without navigating away from the page that they are on. Feedback: Ask for feedback right by asking for comments or even creating a survey. Contact Info: Gather more details about your reader’s contact information. Subscription: Build your email newsletter list by making is easy to subscribe with the click of a link or button. For this tutorial, you will need to install and activate two plugins. First, you will need OptinMonster’s Pro Plan. OptinMonster is the best popup plugin for WordPress. 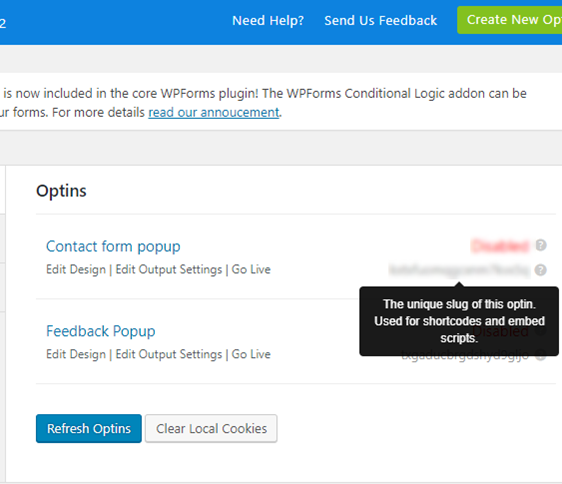 Next, you will also need the WPForms plugin. For more details, see this step by step guide on how to install a plugin in WordPress. The first thing you will need is a simple contact form. If you’ve already created a contact form, you can skip this step. 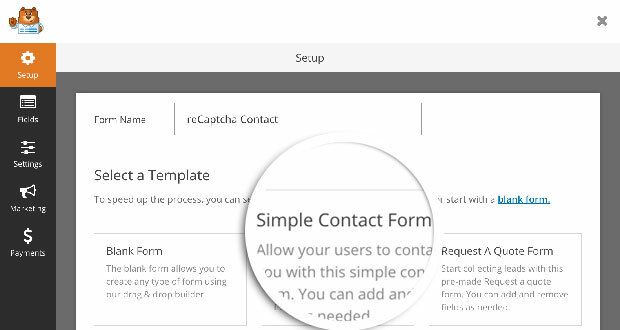 To create your contact form, go to WPForms » Add New to create a new form. On the setup screen, you can choose the Simple Contact Form template to continue. You can drag and drop any additional fields you want from the left side to the preview window. Click on Embed and copy the embed shortcode while you are here. Once you’ve copied the shortcode, head over to the OptinMonster panel and click Create New Optin. Your OptinMonster account will pop out as a new page. In the first step, you’ll be asked to select a campaign type. 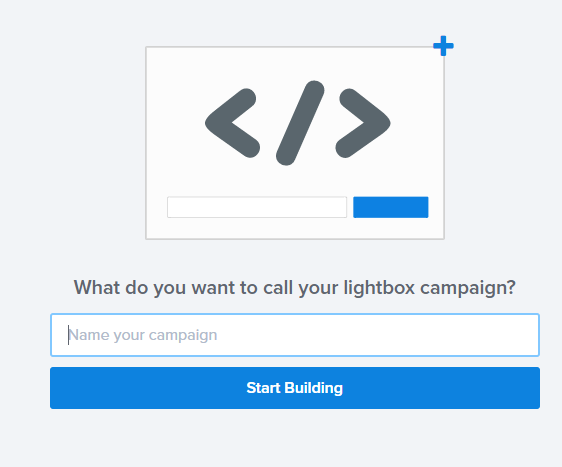 Since we are looking to create a contact form popup, let’s choose Lightbox Popup as the campaign type. 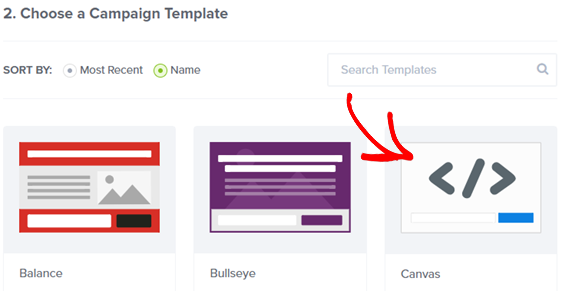 Scroll down the page and choose a campaign template for the new popup you’re going to create. Let’s choose Canvas. For more canvas campaign ideas, you can read 9 unique campaigns you can make with canvas popup. Now you’ll be prompted to enter the name of your campaign. Choose an appropriate name and click Start Building. For the sake of this example, let’s enter Contact form popup as the campaign name. This will bring you to Optin Customizer screen. You will notice that Canvas is blank by design. Now you need to choose the website where you want to display the popup. If you haven’t added the website to OptinMonster yet, click Add a new website. With Canvas, you can create any kind of unique popups from scratch. You can add a signup form, Facebook like box, surveys, coupon codes, or – as we’re doing in this tutorial – a contact form. Under the Optin tab you can choose the height and width of your canvas. By default, it is set to 700 x 350 px. Let’s set the height to 520 at least. In the Custom HTML box, you can enter your contact form shortcode along with any other custom HTML you may want to add. 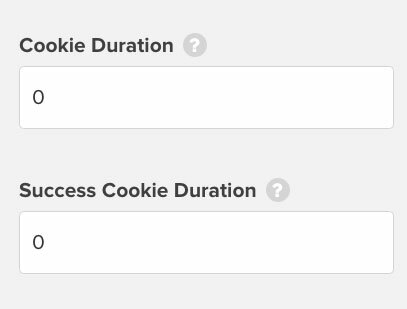 Change both Optin Cookie Duration and Optin Success Cookie Duration to 0. 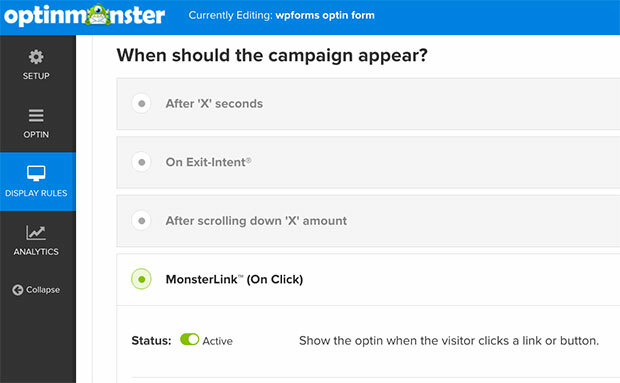 This will stop OptinMonster from setting duration cookies so that your form will remain visible to every visitor every time they click the link. Our popup will only display when a user clicks on a button or a link, so this means we need to enable a manual trigger. Go to Display Rules » MonsterLink. Activating this will cause the form to display when the user clicks on the link. Make sure to Save the campaign and toggle the Publish status from Paused to Live. To change the status, click on Publish near the Save button and then toggle the Status to Live. Go back to your WordPress admin area and click on OptinMonster. You will see your list of optins. If you don’t see your optin, then click the Refresh Optins button. First you need to check the box next to Enable optin on site. In the Who should see this optin dropdown, select Show optin to all visitors and users. If you don’t check these, then the popup will not appear on your site. You can combine the popup forms with our email marketing addons like MailChimp, AWeber, GetResponse, and Campaign Monitor. You’re all set. 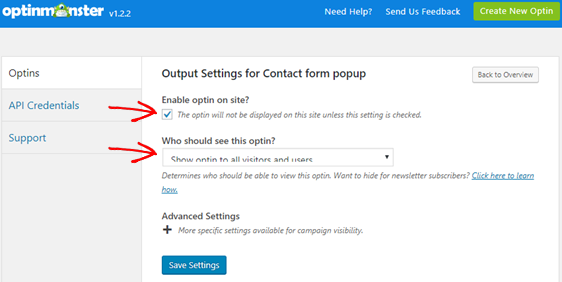 We hope this article helped you to learn how to create a contact form popup in WordPress. You may also want to check out our guide on adding a contact form in a slider, or these tips on where to place a contact form for more leads. do you have any recommendation for a cheaper popup manager? 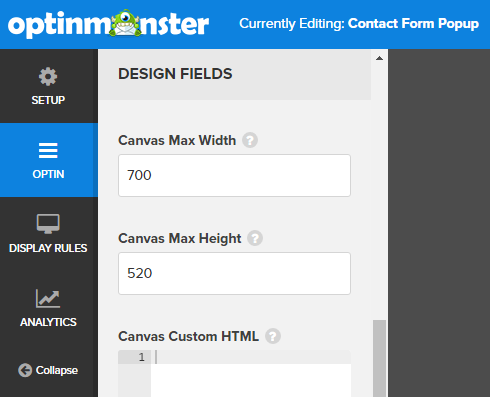 OptinMonster is one of the most expensive in the WordPress plugin market. 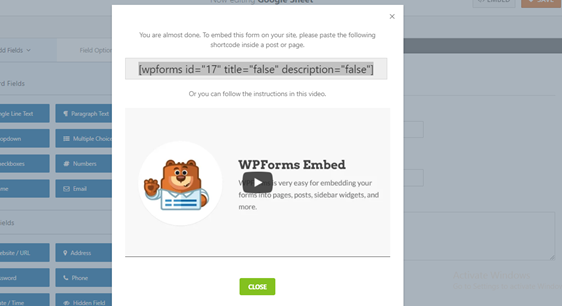 While we love OM, you can use our forms in any WordPress popup plugin that accepts shortcodes. If you’d like to check out a comparison of paid popup plugins, WPBeginner has a great guide. Or there are a bunch of options in the WordPress free plugin repo as well, you may just need to check into/test out whether they accept shortcodes.